There are new lippies causing a stir in the makeup community, not only for their looks but also the low price tag. I’m talking about the L.A. Girl Glazed Lip Paints. When I spotted the display at PHAMExpo almost immediately after treating myself to two Too Faced Melted lipsticks, I did a double take. The L.A. Girl Glazed Lip Paints are said to have the intense pigment of a lipstick, with the shiny finish of a lip gloss (which is basically the recurring trend for new lip products this summer). My first impression when stumbling upon them: the packaging is undoubtedly based on the Too Faced Melted tubes. Not only that, but they had an extremely similar color range. So much so, that I grabbed two shades almost identical to the Melted lipsticks I purchased earlier that day for comparison. Let’s start from the outside and work our way in. Both products are housed in squeeze tubes. While the Melted lipsticks look larger, they actually contain the exact same amount of product (.40 fl oz). I mean, come on people, there is no denying the striking similarity of the packaging. One of the main differences between the two products is the applicator. The Melted lipsticks have a doe foot applicator, where the product dispenses from tiny openings. It’s pretty easy to get controlled application with this, and the lipstick comes out slowly for even coverage. The Glazed Lip Paints have a plastic applicator with a standard lip gloss dispenser. To be honest, it’s really hard to apply the Lip Paints straight from the tube. Because of their glossy texture, it is way too easy to dispense too much product with this packaging. Things can get messy fast if you’re not super careful. I prefer to apply them by dispensing a bead of product onto a lip brush and going from there. 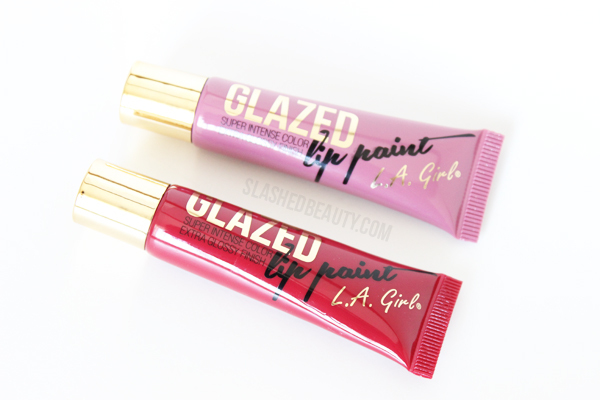 The Glazed Lip Paints have a much glossier texture while the Melted lipsticks are more creamy. The Melted lipsticks will last you up to six hours through eating, while the Glazed Lip Paints need to be reapplied after a meal, and start to fade around hour four. The Glazed Lip Paints seem to dry down to a satin matte finish after about three hours, which is also around the same time my lips started to feel dry. The Melted lipsticks feel comfortable throughout their wear time, and the finish doesn’t seem to change. The main similarity, besides packaging, is the shades. Just by looking at the ranges, you can see which colors match up. Melted Fig and Blushing are both purple-toned mauves. Blushing is only a tad sheerer, and of course more glossy. 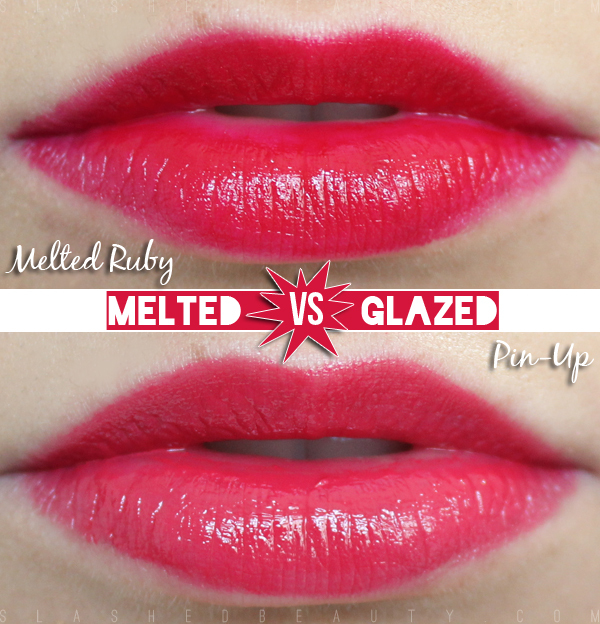 Melted Ruby and Pin-Up are both bright, blue-based reds. Again, Pin-Up has the slightest translucency, but is still highly pigmented. Both formulas only require a little bit of product to get full coverage color. If you apply too much of either, you risk feathering (especially with the Glazed Lip Paints). Overall, I would say that the $4 Glazed Lip Paints can be suitable dupes for the $21 Melted lipsticks in terms of shades and pigmentation. While the formulas have some key differences, you can still achieve a bright, bold lip with the more affordable alternative. The L.A. Girl Melted Lip Paints are available online and in select drugstores, and the Too Faced Melted lipsticks are available at Sephora. Do you think they are similar enough to be considered dupes? I bought these online & I find them more similar to some of my sheerer/shinier OCC lip tars! I don’t know if I would call them dupes but I would say they appear to be equally lovely products. I love my Melted lipsticks but I would still like to have some of these as well. Thank you for this breakdown! I was hesitant about the cheaper options but I think I need some in my life! I wanted these to be dupes. Ah, well. They are still great colors and for the price, well worth it. I still want those Melted colors, though. You picked the two I would have! I tested Melted Ruby on my hand when I was last at Sephora, and that sucker STUCK AROUND. Really well formulated, that one. Great comparison–so good the know the differences. I like that they’re so much cheaper however, I can’t get over the fact that they basically jacked the packaging… seems sketch. This is a great review! Thanks for sharing! I have been searching for a good comparison between both, and let me tell you did I LOVE your review. The shades are so similar but I can see how the Too Faced has more pigmentation and isn’t as glossy, which I actually prefer. I still do want to try the LA Colors but I’m afraid I won’t use them because the gloss finish. I’m so glad I was able to deliver what you were looking for! I also prefer the Melted because I just like creamy textures over glossy ones, but the colors are so similar for people who want a cheap alternative! 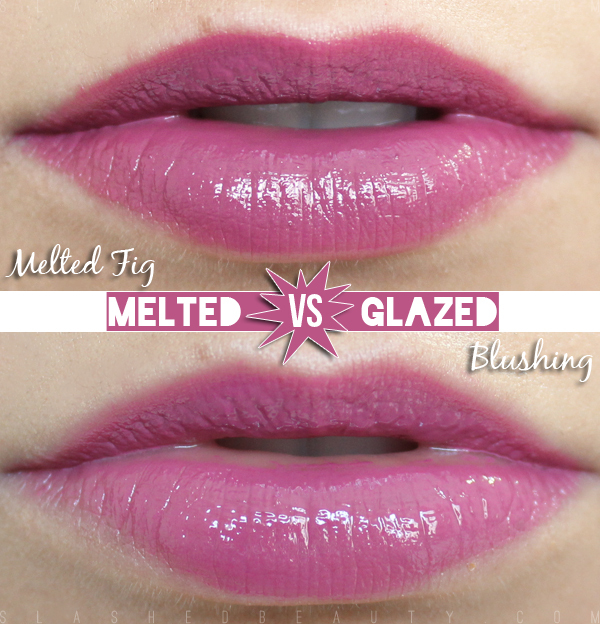 The Melted lippies look more appealing overall to me, but that price difference! For $4, why NOT pick up the Glazed ones? They seem decent. I do prefer the Melted formula because I’m not the hugest fan of glossy textures, but seriously– $4 for Glazed is pretty damn good. They’re not sticky, well pigmented… so I can look past the fact that they’re so glossy. I definitely prefer the Too Faced between the two, but I love how similar they look. Wow. They’re almost exact matches! Thanks! Thank you so so much for this comparison post! I really needed it! I really want to try these. While I like my Too Faced Melted lippie, I find it drying. Wow, these look practically identical! I would definitely consider these to be dupes, although the LA ones are just basically the gloss versions of the TF lipsticks. Yes definitely! Melteds are much more creamy (which I prefer) but to the naked eye, they could be interchangeable! I love the comparisons! I’m on team TF, though. I just like the look of them on my lips better! I would agree these look super similar. The shades are very close too. I need to grab some of those Glazed Lip Paints for sure. Great comparison! They are definitely very close! I would say that is very close!